BEIJING, Jan. 24 (Xinhua) -- One year after Chinese President Xi Jinping further elaborated his vision of building a community with a shared future for humanity on his Swiss trip, the concept has won wider international support due to China's substantial move toward that goal. 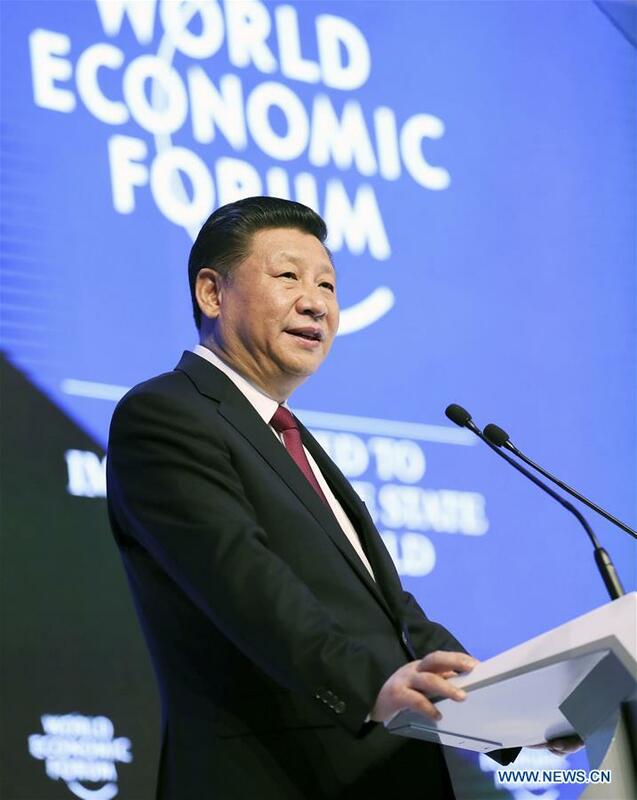 In January 2017, Xi shared his vision at the Davos World Economic Forum (WEF) on how to steer the world economy out of difficulty through concerted efforts, calling on members of the international community to work together to build a community of a shared future for humanity. Speaking later at the United Nations Office in Geneva, Xi called on all countries to work together for an open, inclusive, clean, and beautiful world that enjoys lasting peace, universal security, and common prosperity. The president first introduced the concept of a community with a shared future for humanity when he spoke to the 70th session of the UN General Assembly in September 2015. The concept came as enlightenment in a world faced with common challenges such as growing uncertainties and destabilizing factors. Currently, global economic growth lacks energy; the gap between rich and poor continues to widen; hotspot issues often arise in some regions; unconventional security threats like terrorism, cybersecurity, major infectious diseases, and climate change continue to spread. President Xi's speech was of historical significance, said Klaus Schwab, founder and chief executive of the WEF, adding that Xi highlighted the spirit of inclusiveness and coordination that impressed the participants. "The Chinese leadership has been noted in fields such as climate change, the future of the Internet, as well as development of finance through One Belt One Road. At the same time, we increasingly see China's globalizing enterprises playing a responsible role on the international stage, for example in the area of trade and the circular economy," Schwab told Xinhua in a recent interview. China understands that facts speak louder than words. From providing humanitarian aid to Syria and Africa and participating in UN peacekeeping missions to actively implementing the Paris Agreement and the 2030 Agenda for Sustainable Development, China has taken a more active posture in global governance. As China has suffered a long period of war and plight, it deeply understands the value of peace and holds firm resolve in maintaining peace. China has dispatched over 36,000 peacekeeper and is a major contributor of funds for UN peacekeeping missions. Just as Xi said in his keynote speech at the opening of the Communist Party of China (CPC) in Dialogue with World Political Parties High-Level Meeting in December, "no matter what stage of development it reaches, China will never seek hegemony or engage in expansion." China is aimed at basically realizing socialist modernization by 2035, and building the country into a great modern socialist country by the middle of the 21st century, which will create more development opportunities for other countries. A telling example is the Belt and Road Initiative, which aims to build trade and infrastructure networks connecting Asia with Europe and Africa via overland and maritime routes. Under the framework, China has invested over 50 billion U.S. dollars in concerned countries and generated nearly 200,000 jobs. When protectionism and isolationism have gained momentum in some developed countries since the 2008 global financial crisis, China reiterated its commitment to opening-up and cooperation with other countries. In November this year, China will hold the first China International Import Expo in Shanghai. China's vision of building a community with a shared future for humanity is based on the principle of mutual benefit and win-win cooperation, which is different from the zero-sum game that used to dominate international relations. "China's dramatically increased role in global governance is very positive and one of the most noteworthy aspects of Xi Jinping's foreign policy," said David Shambaugh, a senior fellow at the Brookings Institution. Barely one month after Xi's Davos speech, a community with a shared future for humanity was incorporated into a UN resolution. "Creating a Shared Future in a Fractured World" -- the theme of this year's WEF annual meeting being held in Davos, resonates with Xi's vision of building a community with a shared future for humanity. BEIJING, Jan. 24 (Xinhua) -- Themed "Creating a Shared Future in a Fractured World," the 48th World Economic Forum (WEP) annual meeting in Davos, Switzerland, is urging concerted global efforts to address major challenges from protectionism, terrorism and climate change. BEIJING, Jan. 24 (Xinhua) -- Since Chinese President Xi Jinping made a keynote speech at the United Nations (UN) Office in Geneva titled "Work Together to Build a Community with Shared Future for Mankind" in January 2017, the idea has gained wider international recognition for offering China's solutions to cope with global challenges.